More than two years before Sgt. Maj. Ronald Green was interviewed by Commandant Gen. Joseph Dunford to become the Corps' next top enlisted leader, the two shared a drink from Devil Dog Fountain, a favorite pilgrimage site in France marking the site of the Marines' historic World War I rout of the German Army at Belleau Wood. Now Green and Dunford are again marking history as they prepare to lead the Marine Corps together. Prior to Sgt. Maj. Ronald Green's interview with Commandant Gen. Joseph Dunford in late December, the two men had last encountered each other in Belleau Wood near the Marne River in France for a 2012 Memorial Day ceremony. Dunford was then assistant commandant; Green was sergeant major of I Marine Expeditionary Force in California.Together, they'd taken a drink out of Devil Dog Fountain, a favorite pilgrimage site that takes its name from the legend that German troops, routed at Belleau Wood, gave the name "teufelshunde" to the Marines who fought there. The encounter at the fabled fountain was the last meeting between Dunford, then the assistant commandant, and Green, the top enlisted leader with the California-based I Marine Expeditionary Force, until Green was interviewed by the general in December. Sources close to Dunford say the commandant, who selected Green from a pool of five seasoned and highly qualified sergeants major, was impressed the 31-year Marine having still had a "fire to make things happen" and had an evident enthusiasm for caring for Marines and their families. "Sgt. Maj. Green's experience, both in peacetime and combat, coupled with his record of performance made him extraordinarily well qualified to serve as our next senior enlisted leader," said Lt. Col. Eric Dent, Dunford's spokesman. On Feb. 20, Green will and Dunford will again be marking Marine Corps history when Green becomes the 18th sergeant major of the Marine Corps in a ceremony at the Marine Corps War Memorial near Washington, D.C. He Green will mark the event with his wife, Andrea, and his three children: Quan, 28, Justin, 16, and Jasmine, 12. Now in the fourth decade of his Marine Corps career, Green is still in peak fighting trim. The burly 5'10", 187-pound 50-year-old scored 274 and 292, respectively, on his last physical fitness and combat fitness tests. He also sports expert rifle and pistol badges. Sgt. Maj. Roanld Green (center) at the Marine Corps Training and Education Command unveilling of their new Combat Fitness Test at Henderson Hall in Arlington, Va., August 18, 2008. The test involves a variety of excercises meant to simulate actions in combat - such as crawling, running, carrying a soldier on your shoulders, lifting and running with ammunition boxes, throwing a grenade, pushups, etc. Sgt. 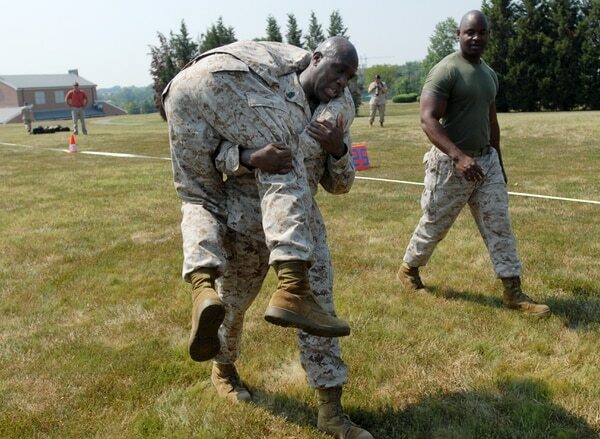 Maj. Ronald Green performs a fireman carry during the combat fitness test after it was unveiled in 2008 at Henderson Hall, Va.
About Some 15 years ago, he was in the first class to make black belt in a precursor to the Marine Corps Martial Arts Program, an honor he said came with few accolades but "lots of bruises." Trained as an artilleryman, Green has always reveled in the physical aspects of his work, too, he said. "We put rounds downrange and supported the infantry, spotted for aircraft," Green said during a phone interview with Marine Corps Times after he was selected by Dunford to serve as his top enlisted adviser earlier this month. "Everything about artillery, I loved it." Those who have served with Green said that love was evident in everything he did, even in his earliest days in the Marine Corps. Jim Sill recalled freezing cold days on the gun line in Okinawa, Japan, with Delta Battery, 2nd Battalion, 12th Marines in the late 1980s. Sill was a freshly promoted new-minted sergeant, and Green a corporal, both in the same platoon. Smack talk on the gun line was commonplace, Sill said, and competition ran high. But Green never missed a step. "It's one thing to be fast, but you have to be safe," Sill said. "Ronnie was lightning fast, and always extremely safe." Green was not your average corporal, said Sill, now 52 and a regional service manager for a Japanese heavy equipment company. He was deeply conscientious about everything from uniform appearance to training. He rarely drank and went out of his way to take care of the more junior Marines in his unit, Sill said. "When we were out on the field, it was always common to see the lowest man on the totem pole get the midnight-to-4 a.m. fire watch," he recalled. "Ronnie stood that fire watch so his Marines could sleep." In 1983, Green was a 19-year-old freshman at Alcorn State University in Lorman, Mississippi, which was about a drive of an hour and change from his hometown in Jackson. Green had grown up on limited means in the small town, raised by a father, mother and stepmother. His upbringing, he said, had taught him resilience, he said, and he learned to treasure a favorite saying of his dad's: "tThe strength of the wolf is in the pack." Soon after starting college, Green realized he wasn't interested or focused on school. He and his best friend, John Davis, started looking for other options. "We didn't think it was our time and we wanted to do something different," he recalled. "Our parents were insistent that we do something positive, of course … and we decided the military was the best thing for us." Green's father had served in the Army, stationed in Germany during the mid-1960s. But he and Davis soon realized the lean, hard appeal of the Marine Corps was what spoke to them most. "The Marine Corps wasn't selling any education, wasn't selling any trinkets," Green said. "It was toughness, and they guaranteed that it was going to make us men and grow us up. So we accepted the challenge." Green and Davis would enter boot camp at Marine Corps Recruit Depot Parris Island, South Carolina, together, landing in the same platoon. "It was tough. Thank God I had my best friend there with me,'" he said. "We didn't get to talk much, but we got a chance to smile and look at each other and know that we were in the right place." Davis would serve an honorable four-year term and depart the Corps, but the two men stayed lifelong friends and still speak often, Green said. By the time Green received his Eeagle, Gglobe and Aanchor pin, he said he knew he had found his life's work. Marines who knew Green over the next decade confirmed that this conviction never wavered. Samuel Andrews, who was a supply chief at 11th Marines in Camp Pendleton, California, when Green was a staff sergeant attached to 2/11, said Green radiated his enthusiasm for the Corps. "If you were in the room with [Staff Sergeantgt. Green] 30 seconds, and you have a 30-second conversation with him, you would know that guy's going to be in for life," said Andrews, now retired and a logistics analyst at the Pentagon, said. "It's who he is." Seven years after Green had stood on the yellow footprints as a recruit, he returned to Parris Island as a drill instructor. He'd spentd four years on the drill field, eventually rising to become senior DI and then a drill master. The duty took him away from the fleet when fellow Marines were deploying to the Middle East in support of Operation Desert Shield and Desert Storm, but it also gave him valuable insight into the making of Marines, he said, and helped him develop a mindset that he'd bring to future units as a staff noncommissioned officer. "We must remind [the Marines] out here, take them back to the Crucible, put that Eeagle, Gglobe and Aanchor in their hand," he said, "and give them that feeling … remind them that they are fighting for something greater than self." Commandant of the Marine Corps Gen. Joseph F. Dunford Jr. announced the selection of Sgt. Maj. Ronald L. Green as the next Sergeant Major of the Marine Corps, Jan. 20, 2015. In this 2014 photo, Sgt. 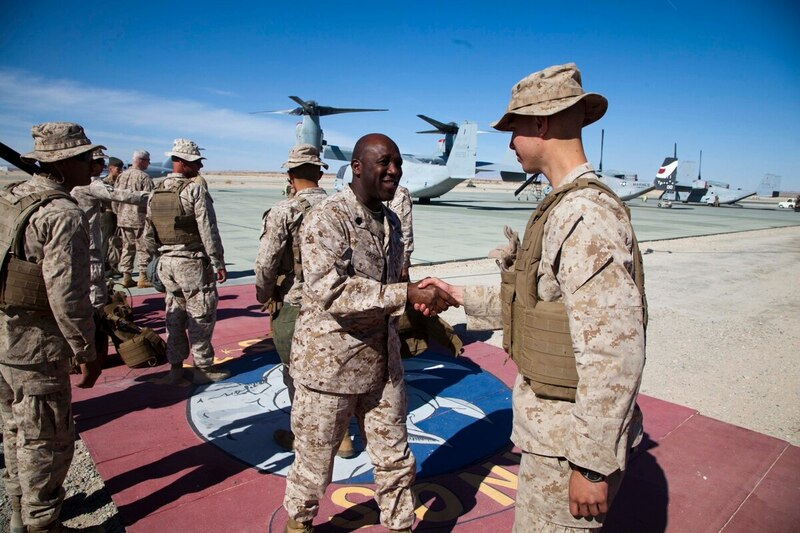 Maj. Green, the I Marine Expeditionary Force's sergeant major, greets Medal of Honor recipient Cpl. William "Kyle" Carpenter aboard Marine Corps base Camp Pendleton, California, June 23, 2014. Sgt. Maj. Ronald Green, the next sergeant major of the Marine Corps, greets Medal of Honor recipient Cpl. William "Kyle" Carpenter aboard Marine Corps base Camp Pendleton, Calif., in June. Green's time as a DI may have also strengthened a quality evident to the troops under him and the generals he'd later serve: his genuine interest in the well-being of the most junior Marines. "I never saw that guy write a charge sheet," Sill remembered of Green. "When a Marine screwed up, instead of ruining him with [non-judicial punishment] or whatever, he was one of those guys who dealt with it internally. His Marines knew if they screwed up, he was disciplining them." While sergeant major at Headquarters Battalion in Henderson Hall, Virginia, Green impressed Lance Cpl. William Ussery, a supply Marine, by strolling up to him just to see how he was doing. He spoke with conviction, but without the noise and bluster Ussery associated with senior enlisted Marines. "Usually [sergeants major are] screaming or they're really loud, but I never remembered him being like that," said Ussery. "He had the raspy drill instructor's voice but he was very soft-spoken about it." Retired Sgt. Maj. Bill Skiles, who worked with Green when both were assigned to units within Marine Aircraft Group 39, remembered him working to fix broken washing machines in the enlisted barracks and changing living arrangements to allow NCOs to stay in the same space. Both were new sergeants major on their first assignment, as well as nd next-door neighbors to boot. Skiles said Green helped coach team sports for the children on the base, including his own three, and frequently offered help with errands and other residential and community projects. "He's a guy I would count on to watch my children, which is hard to find," Skiles said. At his current billet as sergeant major of I MEF, Green is known for pulling off during a drive home after work to chat with a group of junior Marines undergoing required training. "Two hours later, he'll realize he never made it home," said Sgt. 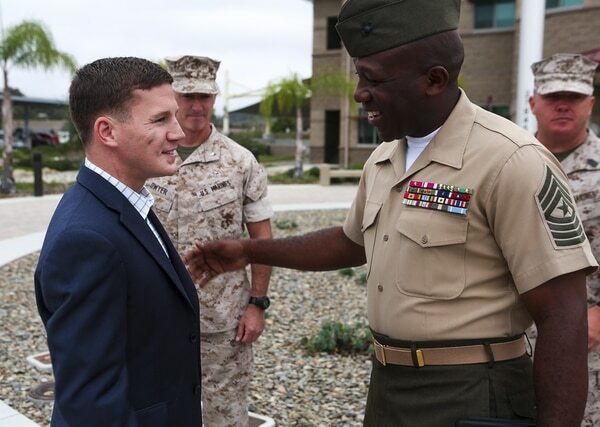 Maj. Richard Thresher, the sergeant major of 1st Marine Logistics Group at Camp Pendleton. Green also refuses to use an assigned driver, even though his rank and position rate one, Thresher said. Instead, he drives a simple white government SUV around base. "He just shows up kind of unannounced, doesn't expect any kind of protocol," he said. "No fancy car, he just gets in it and drives himself." The same down-to-earth attitude applies to his office at I MEF headquarters. Last summer, he received an unexpected visit from Edwin Dario Pena, a retired Marine who had had Green for a senior drill instructor at Parris Island in 1991. While shopping at the Pendleton PX, Pena had been shocked to discover Green's picture hanging with the command portraits near the store's entryway, and went off in search of his former DI. "He looked at me, and right away he said, 'yYou were one of my recruits,'" Pena recalled. They chatted casually for 20 minutes, sharing memories and later exchanging business cards. "He was nothing but humble and open. He genuinely showed me he cared about Marines and what they're doing," said Pena, now a vice president at an IT company that supports the Marine Corps, said. "What more can we ask for from a sergeant major?" Since Green became a sergeant major in 2005, he has served at two three-star commands, a rare distinction for the rank. He was ordered to Marine Corps Forces Europe and Africa in Stuttgart, Germany in 2010, where he advised then-Lt. Gens. John Paxton and Dennis Hejlik. In 2012, he moved to I MEF, where he served with Lt. Gen. John Toolan and later with Lt. Gen. David Berger. When advising the Corps' most senior officers, Green said he has learned to keep his approach simple. "We go over their planning guidance, drill down into it and get on focus," he said. "It's always been mission first, Marines always, no matter who the general I've worked with. As long as they're focused on that, I'm dialed in with that general." Generals who served with Green said they appreciated his straightforward manner and his humility. "He will not hesitate to close the door and tell me frankly when he thinks I'm headed down the wrong path," said Berger, the current commander of I MEF. "Always professional, always with the goal of helping me make the very best decisions possible for this command and for the Marine Corps." Toolan, who now commands Marine Corps Forces Pacific, said Green's wide range of experience and focus on his Marines had made him a valuable asset at I MEF. "He is never in his office, he patrols the fringes of the organization to see what is going on, and lets Marines and sailors know that we appreciate their efforts," he said. "Subordinates, peers and superiors all flock to him, to hear his perspective. There is no ego with Ron Green, he is all heart." In the wake of the Jan. 20 announcement that Green had been selected to be the next sergeant major of the Marine Corps, few have questioned his military character, but some have raised concerns about his combat bona fides. Unlike current Marine Corps Sgt. Maj. Micheal Barrett, a decorated scout sniper with multiple combat deployments, Green has no combat action ribbon and only one full war-zone deployment: a 2006 pump to Iraq with HMLA-169, his first sergeant major assignment. This is due primarily to the timing of key milestones in his career. Green was assigned to inspector-instructor duty at 1st Battalion, 23rd Marines, a Louisiana Reserve unit, in the early 2000s when the first Marines were deploying to Afghanistan. His duties as sergeant major included a tour at Headquarters Battalion at Headquarters Marine CorpsHeadquarters, Henderson Hall, Virginia, which coincided with the end of the Iraq surge and the start of the surge in Afghanistan. The absence of combat awards is not unusual: neither Alford McMichael nor John Estrada, the 14th and 15th sergeants major of the Marine Corps, had a combat action ribbon. Green himself is straightforward about his experiences and his service record. "We don't go around counting one another's ribbons and, you know, kind of stacking each other up," he said. "We're actually too busy to do that. I was selected [as sergeant major of the Marine Corps], I accepted it, and I'm going to do my best to continue doing what I've been doing." Other senior Marines also defended his record and qualifications. "We all see the negative comments," said Thresher. "[Green] has been a sergeant major for ten 10 years. 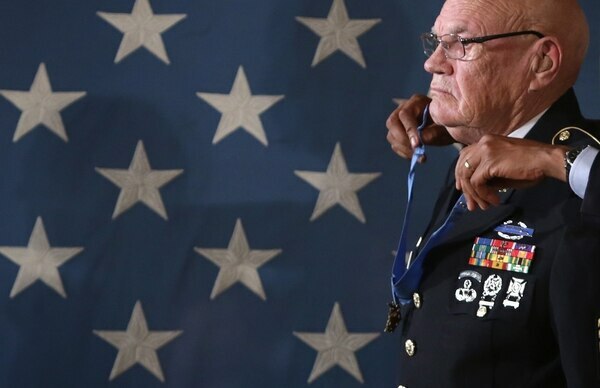 To think that because he doesn't have a combat action ribbon, he doesn't know about combat, is a big mistake." In his interview with Marine Corps Times, Green was guarded about any priorities or projects he might pursue in his new role. "There are no issues close to my heart," he said simply. "Marines are close to my heart." His past work, however, may yield clues to the future. At I MEF, Green's projects have included development of a "smart pack" of resources designed to help senior enlisted leaders handle situations ranging from NJP nonjudicial punishment of junior Marines to a host of administrative matters. He has also worked to develop an expanded Marine Corps professional reading list that includes leadership and sociological titles, as well as military history. Green also helped to improve professional military education and the special duty assignments process at his current post, said Sgt. Maj. Patrick Kimble, the senior enlisted adviser at 3rd Marine Aircraft Wing. It's evident PME, in particular, is a priority for close to Green. 's heart:iIn the last year, he has participated in numerous military education events, including a redesigned corporal's course at 1st Intelligence Battalion, where he served as a guest speaker alongside Medal of Honor recipient Dakota Meyer, and a 3rd MAW seminar for senior enlisted Marines focused on communicating more effectively with the junior ranks. Sgt. Maj. Ronald Green, I Marine Expeditionary Force Sgt. Maj., from Jackson, Miss., came to speak to Marines participating in the 1st Intelligence Battalion Corporals Course aboard Camp Pendleton, Calif., March 27. Sgt. Maj. Green encouraged Marines to always hold themselves to the highest standard and to always look after one another. Sgt. 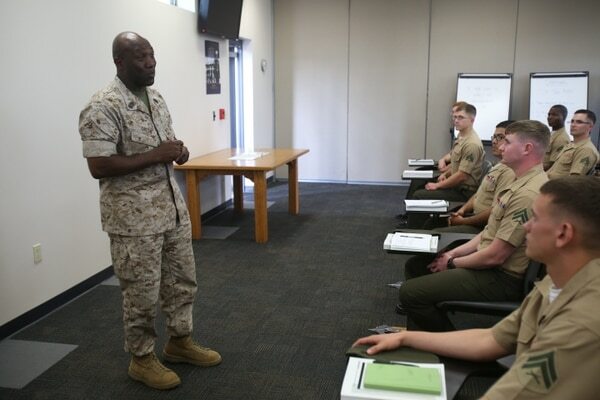 Maj. Ronald Green, the top enlisted leader with I Marine Expeditionary Force, speaks to Marines participating in the 1st Intelligence Battalion corporals course at Camp Pendleton, Calif. General officers who've served with Green say he is committed to professional military education. He recently achieved a major education goal of his own, too: 28 years after beginning college at Alcorn State, he graduated from the University of Maryland in 2011 with a degree in cybersecurity and forensics. "I told my father and mother I would finish that," he said. "And that was my quest ... chipping away one class at a time when I could, when I wasn't deployed or had an opportunity." In wartime or at peace, Green said he wais prepared for the challenge of serving as the voice of enlisted Marines over the next few years. "There's plenty of business to do out there in the name of freedom and the interests of the United States," he said. "We stay focused. We're either in the fight, going to the fight or coming back. That doesn't change for Marines."